For the English cricketer, see Andrew Hawkins (cricketer). For other people, see Andrew Hawkins (disambiguation). Andrew Austin Wyatt Hawkins (born March 10, 1986) is an American football wide receiver for the Cleveland Browns of the National Football League (NFL). He previously played for the NFL's Cincinnati Bengals and St. Louis Rams and also for the Montreal Alouettes in the Canadian Football League, where he was part of back-to-back Grey Cup Championships. He played college football for the Toledo Rockets from 2004 to 2007. Hawkins attended Bishop McCort High School in his hometown of Johnstown, Pennsylvania, where he played football and ran track. In football, he played as a running back and had 562 yards rushing and 10 touchdowns as a senior. He was named second-team All-state as a defensive back by PA Football News and Associated Press, and All-conference as a running back. In track & field, Hawkins competed in sprinting and jumping events. In sprints, he recorded a personal-best time of 11.33 seconds in the 100 meters, and was a member of the 4 × 100 m relay squad. He also participated in long jump (20 ft 2 in) and triple jump (41 ft 8 in). Hawkins chose to attend college at the University of Toledo in Toledo, Ohio. He played at wide receiver and cornerback, making him the first Rocket to play both ways in 48 years. Over four seasons, he played in 37 games, starting in 25. He finished his career with 67 receptions for 1,107 yards and five touchdowns. As a cornerback, he had two forced fumbles, one blocked punt and 21 tackles. Hawkins worked out with the Cleveland Browns after going undrafted in the 2008 draft. He was not signed to play in the NFL and was out of football the entire 2008 season. He then signed with the Canadian Football League's Montreal Alouettes on December 5, 2008. However, before his first CFL season in 2009, Hawkins went to compete on Michael Irvin's football reality show 4th and Long to compete for a spot on the Dallas Cowboys roster. He was named the runner-up. Hawkins then went on to play with the Alouettes for two seasons. He scored his first CFL touchdown on October 12, 2009 during a Thanksgiving Day match-up against the Calgary Stampeders. He totaled 41 receptions, 457 yards and five touchdowns in two seasons for the Alouettes, as well as being a part of the back-to-back Grey Cup championship team. Although technically under contract with the CFL's Montreal Alouettes, Hawkins was permitted to compete as a contestant on Michael Irvin's football reality show 4th and Long. Hawkins was a runner-up to fellow receiver Jesse Holley. Hawkins was cut on the final episode along with future CFL player Ahmaad Smith. On January 12, 2011, Hawkins signed a contract with the NFL's St. Louis Rams. He was waived on August 1, 2011. 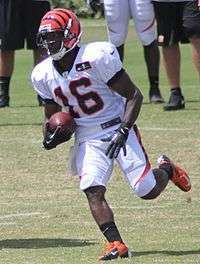 Hawkins at Bengals training camp in 2013. The Cincinnati Bengals claimed Hawkins off waivers on August 1, 2011. He debuted for the team on August 21, 2011 in week 2 of the preseason against New York Jets, catching a 15-yard pass from Dan LeFevour. Hawkins was waived during final-day cuts on September 3 but he was re-signed to the team's practice squad the following day. Hawkins was added to the active roster after Jordan Shipley was placed on injured reserve. Hawkins went on to record 23 receptions for 263 yards, both fifth among the team's receivers. He also had five rushes for 25 yards converted on nine third-down situations. His on-the-field performance has made Hawkins a bit of a "fan favorite" among Bengals fans, who refer to him as "Baby Hawk". He had a breakout season in 2012 for the Bengals, playing in 14 games and totalling 51 receptions for 533 yards and four touchdowns, plus six rushes for 30 yards. In 2013, he suffered a serious ankle injury prior to the preseason and was placed on injured reserve with a designation for a possible return, meaning he could return and play by week 9. He did return and played in the Bengals final eight games, totaling 12 receptions for 199 yards. 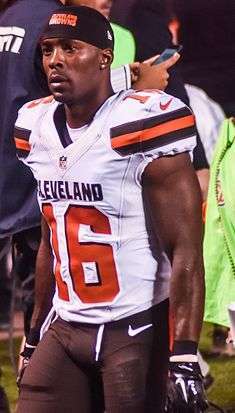 Hawkins signed an offer sheet with the Cleveland Browns on March 12, 2014. The Bengals had until March 18 to match or the offer sheet would become an official contract. The Bengals declined to match the offer, and Hawkins became a member of the Browns with a reported four-year, $13.6 million contract, including a $3.8 million signing bonus. In his first season in Cleveland, Hawkins led the Browns with 63 catches for 824 yards and 2 touchdowns. On December 23, 2015, the Cleveland Browns placed Hawkins on injured reserve and promoted linebacker Jayson DiManche to the 53-man roster. Hawkins is the younger brother of former NFL defensive back Artrell Hawkins. He is also the cousin of CFL slot back Geroy Simon, and former NFL offensive lineman Carlton Haselrig. Hawkins is a Christian. Hawkins has spoken about his faith saying, "I literally thank God every day for what I'm doing right now. I wouldn't change the way I got here at all. It taught me so much. It made me a better person and a better man. I'm just so thankful for where I am, and I wake up every day and thank God for it." Hawkins appears as an extra in the George Clooney film, The Ides of March. ↑ "Andrew Hawkins". NFL Draftscout.com. 2011-04-29. Retrieved 2011-04-28. ↑ Nowicki, Brian (December 5, 2008). "Former Rocket Heading to CFL". Rockets Digest. Retrieved February 4, 2011. ↑ Aron, Jaime (March 11, 2009). "Former college players aim to take TV route to NFL". Associated Press. Retrieved February 4, 2011. ↑ Mastovich, Mike (January 12, 2011). "Hawkins signs deal with Rams". The Tribune-Democrat. Retrieved February 4, 2011. ↑ "Browns sign Jayson DiManche to active roster; place Andrew Hawkins on injured reserve". www.clevelandbrowns.com. Retrieved 2015-12-24. 1 2 Moffat, Rick (January 12, 2011). "Hawk flies coop on Als for NFL's Rams". CJAD. Retrieved February 4, 2011. ↑ "Video of the Week: Browns WR reflects on his faith-filled journey (by the Liberty Flames Sports Network)". ↑ "Hawkins just thankful for chance with Bengals after long road to NFL". Wikimedia Commons has media related to Andrew Hawkins.